Saudi Arabia has finally lifted its ban on women driving. But the repression at the core of the monarchy remains. It was a milestone sixty years in the making. The Kingdom of Saudi Arabia has long been the only country that bars women from obtaining driver’s licenses. The ultra-conservative monarchy instituted the ban in 1957, during the reign of King Saud bin Abdulaziz Al Saud, on the grounds that women driving risked contravening traditional religious values. But last week we learned that this restriction would soon be a thing of the past. On September 26, Saudi King Salman bin Abdulaziz Al Saud issued a decree announcing that the monarchy will, starting next June, begin issuing licenses to women. It’s unclear whether there will be special restrictions on driving privileges, though the decree stipulates that women will be permitted to obtain licenses without getting approval from a male guardian, allaying any concerns that the kingdom’s restrictive “guardianship” laws might undermine the new policy. And a Saudi spokesman made it clear that Saudi women would be able to receive a license at age eighteen, just like Saudi men. In the wake of the decree, the monarchy announced it would also criminalize sexual harassment within the next sixty days, another important sign of progress. Taken together, these reforms could dramatically improve the work prospects (and, to some extent, autonomy) of Saudi women. It will be considerably easier for middle- and lower-class Saudi women — those who can’t afford chauffeurs — to obtain and hold jobs, and criminalizing sexual harassment (assuming the new law is enforced) should make the workplace less hostile. Still, Saudi Arabia has, to put it mildly, a very long way to go in terms of women’s rights. Guardianship laws, which remain in place, reduce Saudi women to the legal status of dependents. Women are unable to travel or open bank accounts without male approval (legally, women do not need male approval to take a job, but private employers often require it anyway). Ironically, while Saudi women will not need the assent of a man to obtain a driver’s license, they will still need it to buy a car. Why did Salman lift the ban on women drivers? Why now? Saudi women first began protesting against the prohibition in 1990, when a convoy of forty-seven women in fifteen cars took a politically charged drive through the streets of Riyadh. Sharif was one of the leaders of a protest movement, called “Women2Drive,” that sprung up in 2011 on the heels of the Arab Spring. The ban on women drivers has long been one of the most visible and easily criticized aspects of the kingdom’s ultra-conservative social policy. And yet for years Riyadh refused to budge on the issue, even when the Taliban’s removal from power in Afghanistan left the kingdom alone in denying women the ability to drive legally. So “why now” is an important question. In part the answer is: because the kingdom seems to be ready for it. As journalist Elizabeth Dickinson points out, technology and a post-9/11 effort to suppress extremism have combined to liberalize Saudi society and weaken the Wahhabi religious establishment’s ability to set and enforce social norms. But there are other, more cynical, reasons behind Salman’s decree. The preferred explanation in Saudi media is that the economy demanded it. Low oil prices and the war in Yemen (more on that later) have sent the kingdom’s finances into the red — Riyadh has run up budget deficits totaling over $200 billion since 2014, and is looking at another deficit in excess of $50 billion this year. There’s a reasonable chance that the Saudi economy will contract this year for the first time since the 2008 financial crisis. Freeing more women up to obtain jobs and increasing the pool of potential car buyers should provide economic boosts. The kingdom’s large foreign driver pool is another consideration. Saudis spent an estimated $6.7 billion on drivers last year, and most of that money was sent abroad as remittances. Letting women drive themselves won’t eliminate the need for drivers, but it should curtail it considerably, which won’t be good for those drivers — or the economies in their home countries — but will be better for the Saudi economy. The future of the Saudi economy is now in the hands of Crown Prince Mohammad bin Salman, whose Vision 2030 plan seeks to steer the kingdom away from dependence on fossil fuels and toward sectors like tourism and entertainment. That effort will require both social reform and foreign investment, and eliminating one of the kingdom’s most visible anti-woman policies is excellent public relations for potential investors. It’s also a way for the crown prince to assert his authority over the kingdom’s conservative religious factions. Speaking of good public relations, the Saudis could use some — and for reasons that go beyond attracting foreign investment. Since becoming defense minister in 2011, bin Salman — his father’s heir apparent — has presided over a foreign policy that can charitably be described as an embarrassing failure. In particular there’s his (America-enabled) intervention in Yemen, which through a combination of air strikes and a naval blockade has killed thousands of Yemeni civilians and left millions more at grave risk of starvation and cholera. The Saudis are facing increasing international pressure for their actions in Yemen. In 2016, the United Nations nearly added the kingdom to its blacklist of children’s rights violators until Saudi threats forced Secretary General Ban Ki-moon to back down. Reportedly, the UN is seriously considering adding them to the list this year. On Friday the UN Human Rights Council agreed to launch an investigation into human rights abuses in Yemen. 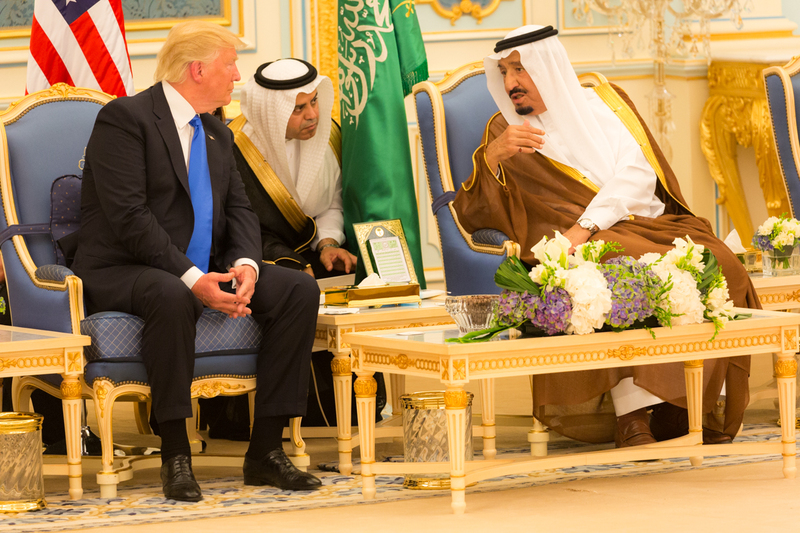 The Saudis grudgingly accepted the measure after previously threatening retaliation against countries that voted in favor of an earlier, stronger resolution that would have established a formal Commission of Inquiry. In general, Saudi Arabia’s egregious human rights record has come under greater and well-deserved scrutiny in recent years, and while last week’s measures were two important victories for women’s rights, the situation is getting worse on other fronts. Last month, Saudi authorities rounded up dozens of dissidents and government critics in a systematic crackdown on free expression. These critics run the gamut from pro-democracy activists to ultra-conservative clerics, but their arrests all make one thing perfectly clear: whatever appreciation bin Salman may have for reforming Saudi society, it does not extend to recognizing free speech rights. Nobody has felt Riyadh’s wrath like the (now-former) residents of Awamiyah, a centuries-old, predominantly Shia town in eastern Saudi Arabia that had been the home of executed Shia preacher Nimr al-Nimr. Under the guise of redevelopment and fighting “terrorism,” Saudi authorities spent the summer cleansing Awamiyah of its Shia inhabitants and demolishing most of its buildings. The scale of the destruction the Saudis inflicted upon Awamiyah would not seem out of place in Syria, or Iraq, but it hasn’t received nearly the same attention in European or US media outlets — and the Saudis would no doubt prefer that remains the case. Perhaps it’s no wonder, then, that the Saudis were looking to make a big public show of liberalization, something to draw attention away from their abuses in Yemen, their religious cleansing operation in Awamiyah, and their ongoing criminalization of political dissent. In that sense, the ban on women drivers was tailor-made for Riyadh. The ban has always been — even in the Saudi context — an oddity, even an absurdity, a bridge much too far. Its removal is certainly good news for Saudi women, but in the grand scheme of things does little to change the fundamental repression at the core of the Saudi enterprise. Women will continue to be oppressed in Saudi Arabia, as will political dissidents of all stripes. The Saudis will continue brutalizing the Yemeni people and their own Shia minority. The recent decree will change none of this. But because the driving prohibition was so infamous, because it was the public symbol of Saudi reaction for so long, lifting it is Riyadh’s ultimate “what about” moment. The Saudis are betting that by making a big show of allowing women to get behind the wheel, they can bamboozle western liberals into ignoring the litany of Saudi abuses and heap praise on them for removing a legal restriction that never should have been put in place to begin with. And judging by the reaction from prominent figures like Hillary Clinton, they’re winning that bet. Derek Davison is a writer and analyst specializing in the Middle East and American foreign policy.